I have been looking for some special gifts to give to three former colleagues and then I remembered an earlier conversation I had with James (nb Lois-Jane). He had mentioned they were planning to start a hand-made pen business in 2015. A hand made pen seemed an excellent gift and so I left a comment on their blog enquiring whether James had already made some for stock. I was in luck. He actually had a reasonable range of pens and Debbie pointed me to another blog where they could be viewed. Click on the “Available Pens” tab at the top of the blog below the banner to see the range. After browsing through the range I selected and ordered three pens. My colleagues in The Land of Sand love timber, probably because there isn’t much of it in their country. 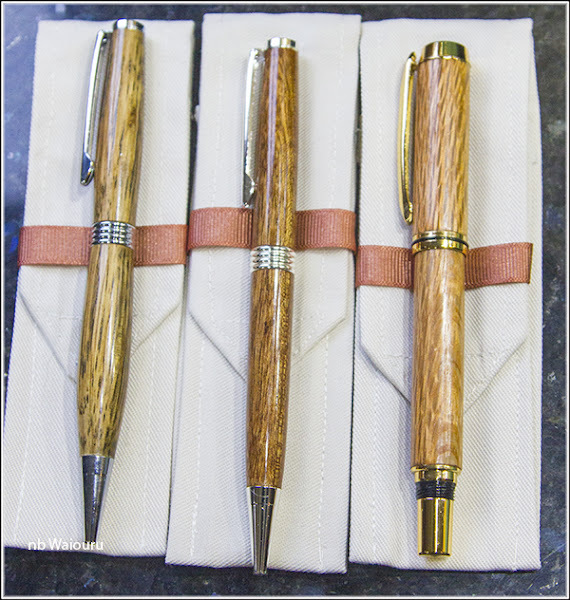 I therefore decided to select three pens made from different timbers. Debbie had them sent to Rugby Post Office using the Post Restante service and I collected them today. They look very good and are certainly unique. Who can claim they have a hand made pen? Thanks James and Debbie. Best of luck with the venture! Thank you Tom. I'm glad they arrived safely and hope your colleagues enjoy them. Next year we will be joining up with some of the floating markets.